Paroled from military prison, Dorothea wants to kick back and become a regular citizen with a regular job but the wrong people remember who she is, what she’s done, and who she’s killed. Those people want her dead, and they’re willing to pay. 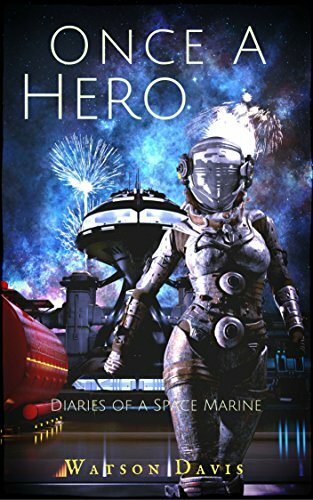 Welcome to the first novella in the Diaries of a Space Marine military science fiction series, a rousing tale of a warrior who’s trying to fit in. Buy this book and start the adventure. I really enjoyed reading Once A Hero. While short, it was full of action and science fiction (hello, on a different plant) with a main character that I didn’t know if I wanted to feel bad for, strangle her or a combination of both. Not a lot of background is given about Dorothea, just that she was in jail for war crimes and that she was hated by the population. So when she was paroled, I knew that trouble was going to follow her and oh boy did it. I really can’t go into the book except that it does get interesting when she is released. People are out to get her and she literally cannot go anywhere without someone attacking her. Which explains why she did what she did later in the book. Heck, I would have done the same thing. For it being a short story, I felt that the author did do a great job with letting me get to know Dorothea. I also liked that he set up for the other book. How he did that, I really can’t say (will be giving away a major reveal in the plot). I am very interested in seeing how the other book pans out. Because of Dorothea’s choices. This would be a perfect book for the beach, pool or sitting out back with your kids during summer vacation (guess where I read Once A Hero….lol). Why: Short but good. Makes you need to read the next book.